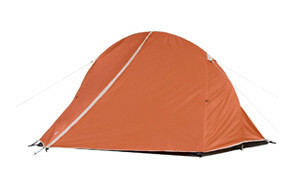 This features seriously impressive water resistancy which make it the perfect beach tent for lakeside camping trips or fishing holidays for example. Coleman Tenaya Lake Cabin Tent is marketed as one of their fast pitch tents and although it is relatively quick to assemble, this isn’t a simple pop up variety and it will take you about 9 minutes to fully assemble. Whilst it can accommodate 8 people, you will probably feel more comfortable with just the 6 so that you can really stretch out and enjoy all the positive features that this tent has to offer. It comes with its own internal storage system for example; how neat is that! No excuse not to get yourselves organised or to leave your clothes lying around when you have a tent equipped with its own closet. There are also illuminated guy ropes that help you to better see in the dark; no unwanted tripping up late at night, especially if you are pitched by the side of a river. With all these features it’s not the lightest or most portable of tents and you do really need two pairs of hands to erect it. 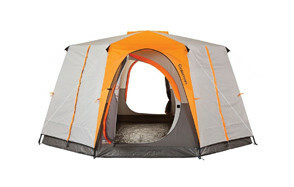 A very roomy tent though overall that offers outstanding weather resistancy and also internal privacy too. Modified dome style tents - Again, Coleman has plenty of options in this category for you to consider including their Montane model. High on comfort and performance, this hybrid style has been modified to accommodate for more bodies. It’s a fantastic choice because it provides plenty of all important features and benefits at an affordable price and comes with those all-important privacy dividers too. Cabin style Coleman Tents - Generally, a little bit smaller in terms of their main sleeping area, they tend to be more lightweight to easier to transport which makes them a great option for backpackers or anyone who just fancies upping sticks at the weekend, jumping on their bike, heading down the freeway and finding somewhere to pitch up and enjoy a night beneath the stars. Usually you’ll find that they also come with handy little add on features like an extendable porch. Size - Again this is down to your own preference and the number of individuals (adults and kids) that will be regularly camping out with you. Roughly though, you should be calculating that each person needs 30 square metres of space. Don’t forget that there will be most than just physical bodies inside your tent too and make sure you all for plenty of space for all your essential, bedding, clothes and bags too etc. You can always opt for a tent that has an extendable section or a vestibule area that allows you to spill out and use other areas for storage rather than taking up valuable internal space. Shape - We covered off the various shapes above and you can get everything from a dome to an octagon and a high top style tepee tent. The shape you go for will largely be decided by how many people you need to accommodate, what type of camping trips you are going on and of course your own personal style and taste too. Season - If you’re not quite sure about this one yet, then you are probably best opting for something called a three season tent. 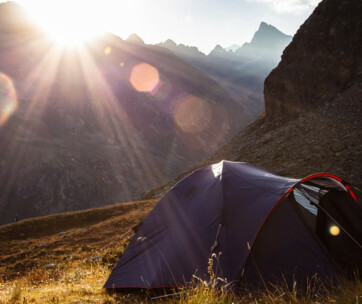 You guessed it, this is going to suit you just fine for Spring, Summer and Autumn outdoors camping where moderate rather than extreme weather conditions are more likely to be the order of the day. If you know that you want to camp out in the deep winter with zero temperatures and plenty of snow fall, then get yourself something that offers higher levels of insulation and protection from the elements and is double layered. 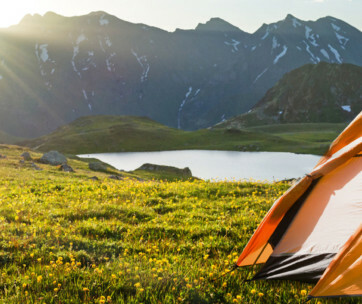 For summer camping you are going to be gar more interested in ventilation and air flow and ensuring that your tent is of a light weight and breathable construction so that you can comfortably sleep through the night. Material - Go for a tent that’s been constructed from a high quality and weather durable fabric that way you can be sure that your investment will last. Look for materials that claim to be rip resistant as these make a good option or go for something that’s not just waterproof but also breathable too. Check out the following options of poly cotton, cotton canvas and also a high grade polyester. Weight - This is an important consideration depending upon when and where you will be camping. If you are backpacking, then you need something lightweight and portable. If you are going with friends and family and you can access to a car or trailer, then you can opt for something heavier. 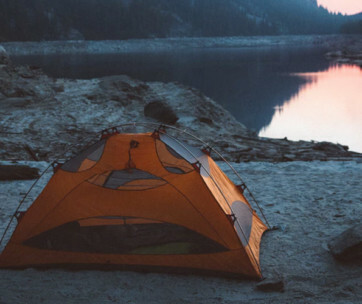 The last thing you want to be worried about is carrying around a back breaking tent all day long so make sure you get something that suits your own camping purposes. 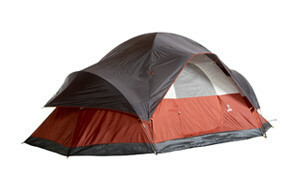 Packability - It might be easier to try and fold and pack your tent away using the original folds as your guideline. After a few years and with more regular use these will become less prominent and the lines may have faded. If that’s the case, then a good trick is to roughly fold your tent to the same size as your tent poles before you start to roll and pack it back into its original case (if you still have it after all these years). Depending upon the size and model of the tent that you’ve ended up purchasing it may be incredibly light weight and portable and very neatly and easily be pack away, ideal for your next back packing trip. Otherwise, a little bit of patience and practise and you will soon get to being as good at packing down your Coleman tent as you now are at assembling it.